Over the 2018 Holiday period, there are times when parking at Grouse Mountain may become tight. 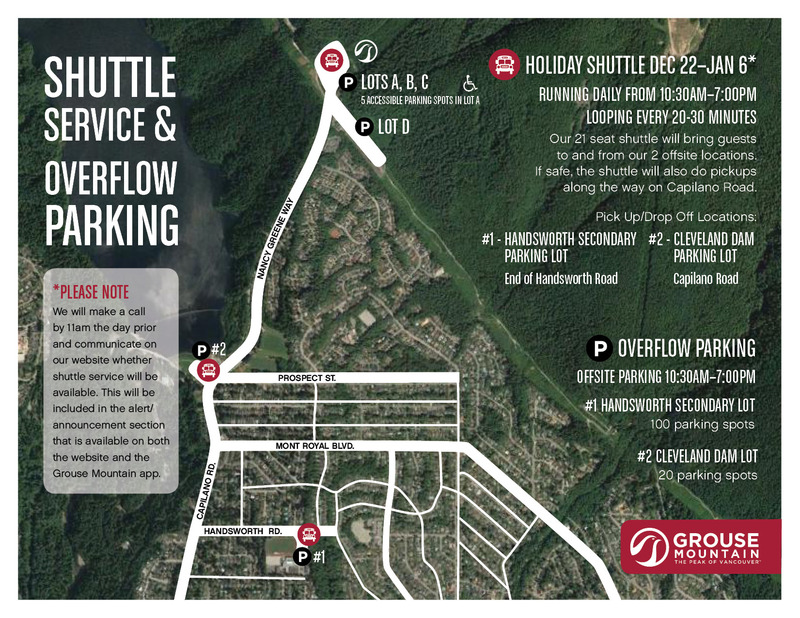 To ease access to parking, Grouse Mountain is running a Holiday Shuttle from Handsworth Secondary School and Cleveland Dam lot on busy days. Each day at 11am we will confirm whether the Shuttle will run on the next day. This information will be included in our announcement/alert section on the Current Conditions page. Should volume necessitate, we will open a second overflow parking lot at Handsworth Secondary School and Cleveland Dam. Grouse Mountain is also the only North Shore mountain accessible by BC Transit. The public transit system offers regular service to and from the base of Grouse Mountain every half hour. Catch Bus 232 - Phibbs Exchange or Bus 236 - Lonsdale Quay. For more details, visit the TransLink website. Click here to download a PDF of the Parking Map.